Extra Large Spelled Out House Number - - One, two, three, and so on. Display your address in words instead of numerals. 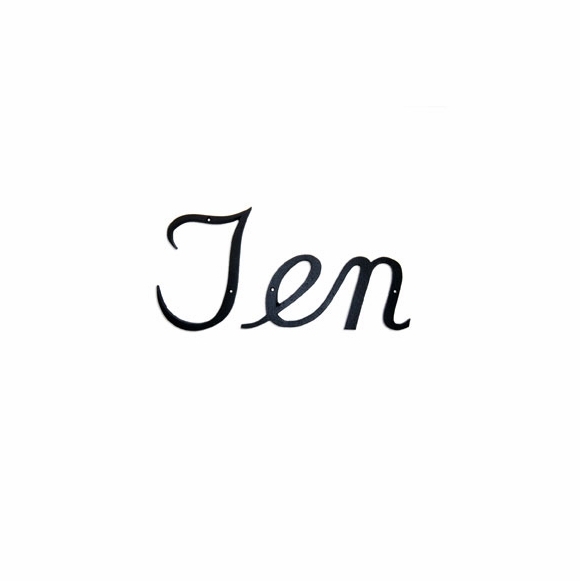 The cursive words shown here are large (Fourteen, for example, is 24" long) and often work best as single-word numbers or two-word numbers (such as Two Hundred or Sixty Two). They look best on a large, imposing surface. Also referred to as our cursive home address sign. For smaller word numbers, click the Script House Number link in Related Products. Rust-free cast aluminum home address numbers written out in distinctive handwriting. Made in USA. Individual numbers from Zero to Twenty, Thirty to Ninety, Hundred, and Thousand. Each full word is spelled out in cursive script. See examples above. Available in four colors: black, gold, white, chocolate brown. Numbers vary in actual length x height. Please measure your total space and then check the dimensions below to make sure you have enough room. Be sure to factor in the space between each word when you calculate space requirement. Dimensions below are inches shown in L x H format. Please order your individual numbers one at a time. Extra large cursive script address numbers custom made for you in the USA. Love them! I searched for a pretty font and these are perfect! Exactly as it appears. Glad I ordered the x-large size, stands out clearly on our house. Actually 2 screws were missing from original order. When contacted company, received within 2 days. Excellent product and service.